Where Do All The New Assault Rifles Come From? Following the February 14th mass shooting at the Stoneman Douglas School in Parkland, Florida, a newly impassioned debate has erupted, as follows every mass shooting in the US, about how to prevent such events from reoccurring. One side focuses on easy civilian access to military-style guns, such as the AR-15 semi-automatic rifle. The other focuses on the individuals who perpetrate these acts, in particular their mental health. 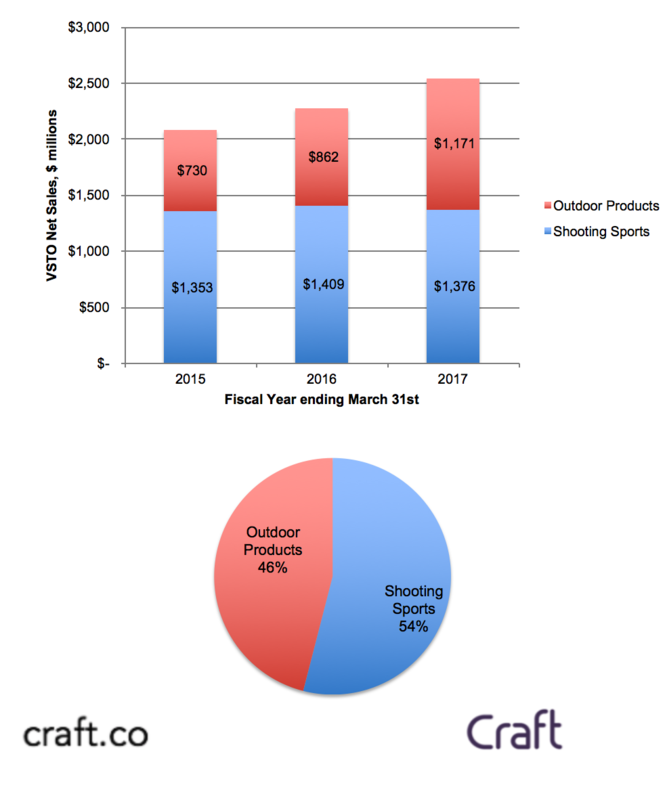 We wanted to contribute to the conversation by analyzing the gun manufacturers, to understand: how many such guns are being produced, how much revenue and profit is generated from their sale. 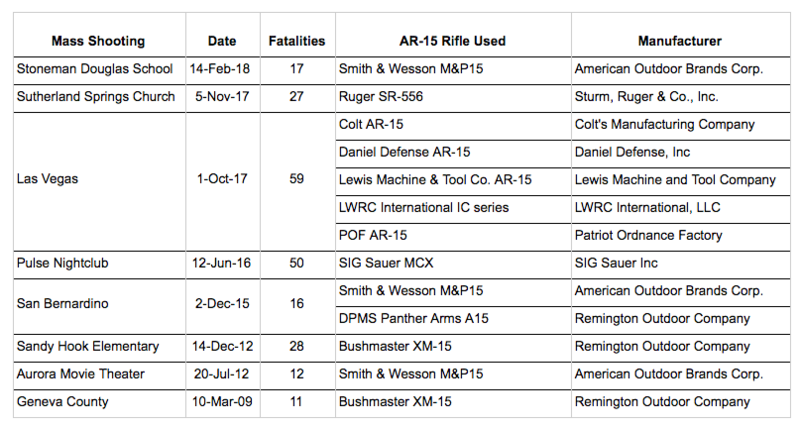 We found there are currently at least 23 different models of AR-15 available for civilian purchase in the US, from 18 different manufacturers. Of these, 15 are private companies, while 3 are publicly-traded. We found no clear correlation between mass shootings and changes in the gun manufacturers’ share price. Two of the three companies have diversified into outdoor products, and changed their corporate names to deemphasize their firearm brands. In the most deadly 12 mass shootings in the US in the past decade, a total of 270 people were killed. In 8 of these shootings, an AR-15 style semi-automatic rifle was used. The most commonly used AR-15 was the Smith & Wesson M&P15, manufactured by American Outdoor Brands Corporation, used in 3 of the shootings. The next most commonly used AR-15 was the Bushmaster XM-15, manufactured by Remington Outdoor Company used in 2 of the shootings. 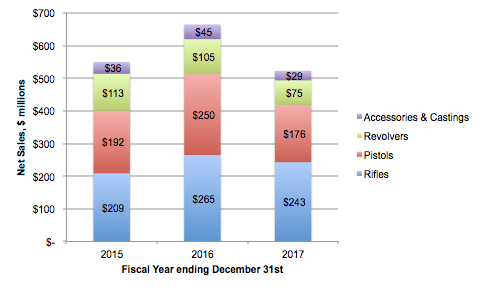 We examined financial filings of the public gun manufacturers to understand how many such rifles are produced and how much money is generated from their sale. The table shows that all 3 of the public gun manufacturers have a stock market value less than $1 Billion, and all three have experienced declining stock market value, sales and profits during the past year. Since the launch of the March for our Lives movement, it will be interesting to see if demand for firearms increases, stoked by fears among gun enthusiasts that stricter regulation may be ahead. Previously named Smith & Wesson Holding Corp, the company rebranded as American Outdoor Brands in 2017. 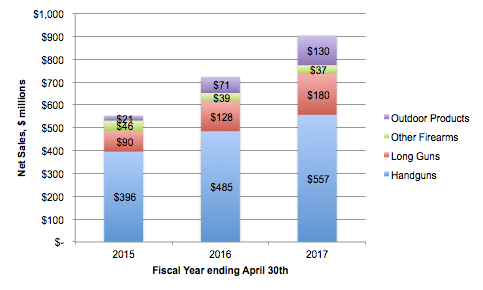 AOBC’s Long Guns revenue doubled from 2015 to 2017. In 2017, AOBC shipped 420,000 Long guns, of which 93% were to Consumers and 7% to the Professional channel such as law enforcement. 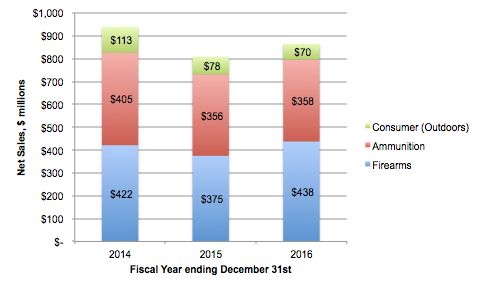 From these figures, we calculated that AOBC generated an average of $428 per long gun shipped. The company employed 2,204 people as of May 2017, an increase of 19% from May 2016. Vista Outdoor was incorporated in 2014 as a combination of Alliant Techsystems and other brands and businesses, which were combined into two business lines — Shooting Sports and Outdoor Products. In Outdoor Products, Vista has 35 brands including Camelbak, Serengeti, Bollé and Eagle. In Shooting Sports, it has 12 brands including Savage Arms, which makes the MSR-15 semi-automatic rifle. 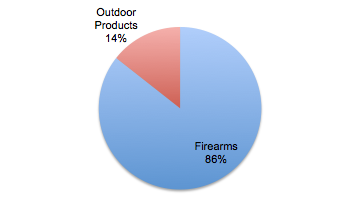 Approximately 54% of its 2017 sales were in Firearms. Sturm Ruger was founded in 1949 and manufactures rifles, pistols, revolvers, accessories and castings, including the SR-556 semi-automatic rifle. Unlike AOBC and Vista who have diversified into Outdoor Products, Ruger is a pure-play firearms manufacturer. The company had 1,838 employees as at December 2017, a reduction of 13% from the previous year. While not public, Remington publishes financial filings because it has publicly issued debt. Remington was founded in 1816 and manufacturers Modern Sport Rifles under the Remington, Bushmaster and DPMS brands, as well as Ammunition, and Outdoor Products. On March 25th, 2018, Remington filed for Chapter 11 bankruptcy, allowing it to restructure its $700 million debt while continuing its operations. Its owner Cerberus Capital Management reportedly plans to cease ownership of the company following the restructuring. As at March 30, 2017, Remington had approximately 3,500 employees, and is headquartered in Madison, North Carolina. This table aggregates the largest 5 shareholders in each of the 3 public gun manufacturers. From this we see, there is a very high concentration of ownership in a small number of shareholders. 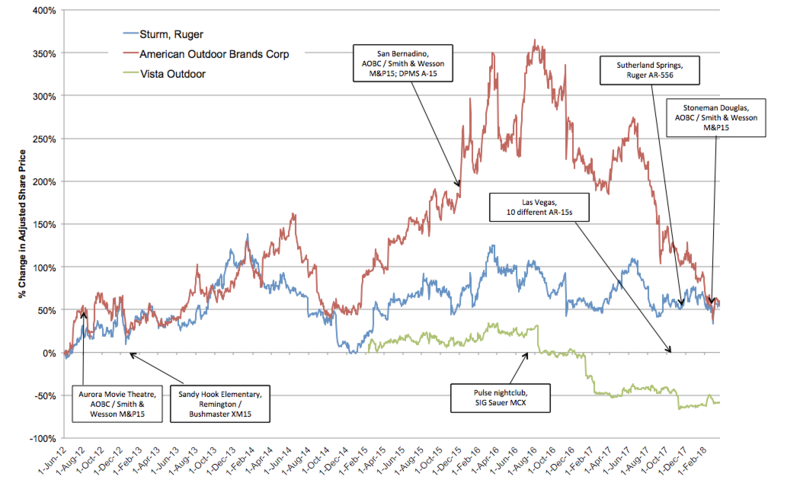 For example, the top 5 shareholders in Vista Outdoors own 53% of the company. In Ruger, the top 5 hold 47%, and in AOBC the Top 5 hold over one third of the company. Across all 3, BlackRock, the largest asset manager in the world, holds 13% of the combined shares of these 3 companies, while Vanguard holds 9%, and Fidelity 7%. The 10 shareholders above hold 45% of the entire sector. We looked to see if there was any discernible pattern in gun manufacturer share price following the 12 most deadly mass shooting incidents of the past decade. We compared each company’s share price 1 day prior to the mass shooting to its share price 5 trading days after. 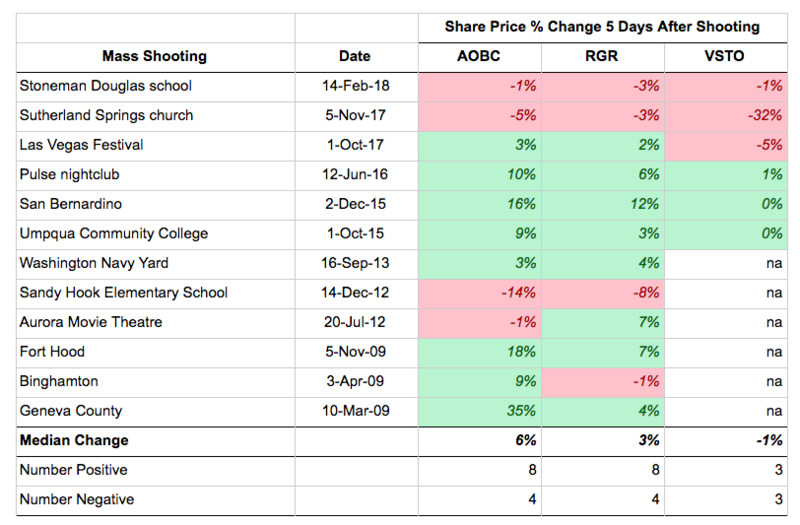 Across the periods, the median 5 day share price change was +6% for AOBC, +3% for Ruger and -1% for Vista. In total, 19 of the movements were positive and 11 were negative, roughly a 2:1 ratio of positive share price movements to negative. One possible theory is that high profile shootings spur consumer demand for guns, due to fears that the events may lead to stricter gun controls, and increased future demand then results in higher share prices. Following the Stoneman Douglas shooting, the largest shareholder in American Outdoor Brands Corporation, BlackRock, sent written questions asking about AOBC’s response to the shooting, in which one of AOBC firearms, the Smith & Wesson M&P15 was used. The vision of firearm manufacturers focuses on the fully legal use of their products for hunting, sport shooting and self-defense. When it comes to criminal usage, the manufacturers believe deeply that they are not responsible. Following the Stoneman Douglas massacre, the March for our Lives movement has renewed calls for two laws in particular: to ban weapons designated “assault weapons” including AR-15 style rifles, and large capacity magazines. While media attention has focused most heavily on the NRA on one hand and gun control advocates on the other, we hope it has been helpful to examine the commercial organizations relevant to the debate, namely the companies that manufacture these firearms. This entry was posted in gun control, Guns and tagged AR-15, Assault Rifle, Firearms on March 29, 2018 by Bone Fish.